Nutritionist JJ Virgin shares the story of a hit-and-run accident that nearly took her son’s life, and how she and her son both came out stronger. 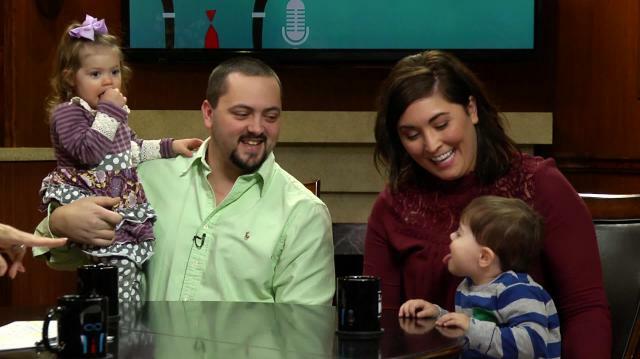 Later, Jessica & Kyle Davenport join to discuss their kids’ rare condition, SIOD, and the fight for a cure. In this episode about nutrition and overcoming obstacles, Larry meets with JJ Virgin, a nutrition specialist, fitness and weight loss expert, and the author of fourNew York Timesbestsellers. Her latest book is a memoir,Miracle Mindset,based on a hit-and-run accident four years ago that her son Grant, then 16 years old, was severely injured in. Virgin talks about how doctors said Grant had a 2.5 percent chance of survival, and how they predicted he would not survive any airlifts or surgeries for his torn aorta and brain bleeds. Despite these low odds, she had her son airlifted to a hospital with great doctors. Grant survived his surgeries, then was in a coma for several weeks and in the hospital for 4.5 months. Though not a doctor, Virgin took a PhD program in nutrition since she was fascinated by why people couldn’t lose weight. Larry asks if sugar is a bad thing, and she responds it’s the #1 recreational drug of choice. She recommends decreasing sugar intake and increasing healthy fats intake, then talks about supposedly healthy foods have different effects based on the person. Finally, she lists 7 foods to generally avoid: gluten, dairy, soy, corn, eggs, peanuts, sugar and artificial sweeteners. The next segment is hosted by Shawn King, who interviews Jessica and Kyle Davenport from Muscle Shoals, Alabama. The Davenports are parents to 3-year-old Kruz and 2-year-old Paizlee, both of whom have an incredibly rare disorder, Schimke Immuno-osseous Dysplasia (SIOD), which causes dwarfism, kidney failure, a weakened immune system, and a 9-11 year life expectancy. Kruz and Paizlee are, respectively, the fourth and fifth living, reported cases of SIOD in America. The Davenports have launched the Kruz’n For a Kure Foundation as a national campaign to raise awareness and money for treatment and research. They talk about how the kids are home most of the time due to the immune system issues, and how cleanliness is extremely important. Recounting Kruz’s diagnosis, the Davenports relate how it took 2 years and 10 specialists to find the correct disorder. Despite Paizlee seeming like a different kid, she was also diagnosed after a routine check. The odds that the Davenports would both be carriers of the mutated gene and meet are 1 in 3 million, with a 1 in 4 chance that they would pass the disease to their children. Neither of the kids know they have the disease, only that they go to the doctors and get shots a lot. Shawn asks how the couple works together to deal with the stresses. Jessica became a stay-at-home mom to care for the kids, and Kyle says that they’re “fighting the same battle, fighting for the kids.” They hang onto a hope for a cure, and managed to raise $250,000in 150 dayson their site,kruznforakurefoundation.com. Currently, the Davenports are working with Stanford doctors to find a cure, though the projected research timeframe is 5 years. However, the Davenports praise their support network of family, friends, and their community, who treat the kids like local celebrities. Cue the physical entrance of the kids, who goof off in the studio, and who are also shown, in video clips, meeting University of Alabama football players. Towards the end, the kids say thank you to Shawn for having them on the show.